Little is known of St. Matthias. He was an earlier follower of Jesus and the Twelve Apostles. After the crucifixion and resurrection, the Apostles had to re-evaluate their team and mission. They were one Apostle short. According to the author of the Acts of the Apostles, St. Peter asked the Apostles to consider either Barabbas (aka Joseph, Justus) or Matthias. After some deliberation, the Apostles chose Matthias. My comments and reflection are a little limited. 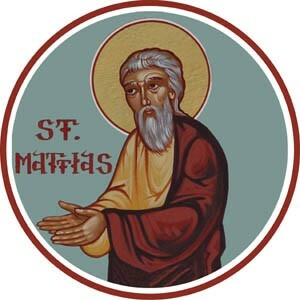 There is little to no information on St. Matthias except he being the replacement of Judas Iscariot. Either way, St. Matthias, like the other eleven, served the church and the “Way” of Jesus Christ during a time in which mass hysteria, confusion, sorrow, and joy was occurring all at the same time. Not everyone could have been faithful enough to step up and serve in that capacity. In the end, the lesson I learned from St. Matthias is that faithfulness and service goes beyond the state of affairs of everyone around you. The relationship between you and God is a constant.